"failing to find anything there go north to Sandstone Rock Reservoir and look for a letter there". Ion Idriess, Lasseter's Last Ride, pg. 242. A descriptive name by W. H. Tietkens, leader of the Central Australian Exploring and Prospecting Association's 1889 expedition and shown as Pine Sandstone Reservoir on Finlayson's 1935 map of Central Australia. According to Philip Taylor's letter of instruction to Bob Buck, Sandstone Rock Reservoir should have been the second locale searched for any sign of Harold Lasseter, after first checking the vicinity of Bowley's Range, about 35 miles to the south. The inclusion of this ephemeral rock hole in Buck's itinerary is anomalous as it is the only place, in a list of eight that Buck should search, that was not named or visited by Ernest Giles during his 1873/74 traverse of the Petermann and Rawlinson Ranges. A diversion to Sandstone Rock Reservoir and return to Bowley's Range would add seventy or more miles to Buck's line of march if he were following Giles map and Taylor's instructions and it's not surprising to find Lasseter makes no mention of the place in his diary or correspondence. As events unfolded in March 1931, Buck had no reason to travel to the rockhole, he discovered Lasseter's body at Winters Glen, in sight of Mount Bowley, on the 28th of March. Sandstone Rock Reservoir is an obscure location in Lasseter lore, rarely shown on maps of any vintage or scale and only mentioned in later editions of Lasseter's Last Ride, Ern Bailey, Company Secretary for C.A.G.E. 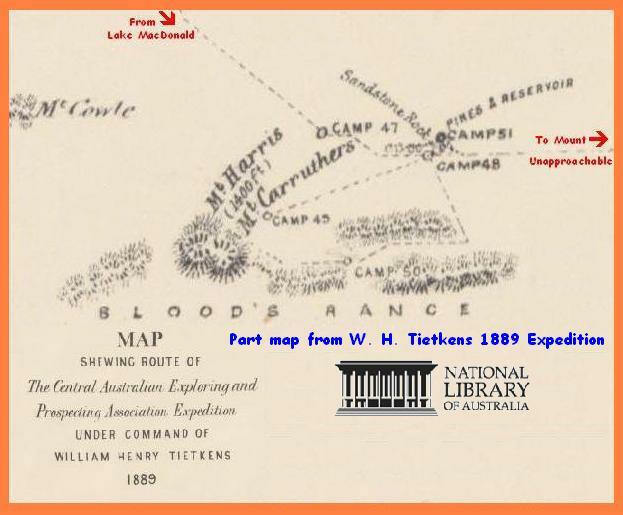 had asked Idriess to withhold earlier reference to Lasseter's supposed route to Lake Christopher, "pending the result of the second expedition". The Second C.A.G.E. Expedition, under the leadership of Buck, did not visit the rockhole as it was quickly deduced from tracks, campfires and the Aboriginals that Lasseter did not leave the vicinity of the main ranges. Ion Idriess, Lasseter's Last Ride. 10th Edn. pgs, 242&243. The Advertiser, 02/11/1889. pgs.5&6. The Argus,12/08/1889. pg.6. National Archives Australia, Title, Aboriginal Reserve, Musgrave, Mann and Tompkinson Ranges, Series A3. C/S, NT1914/7104. 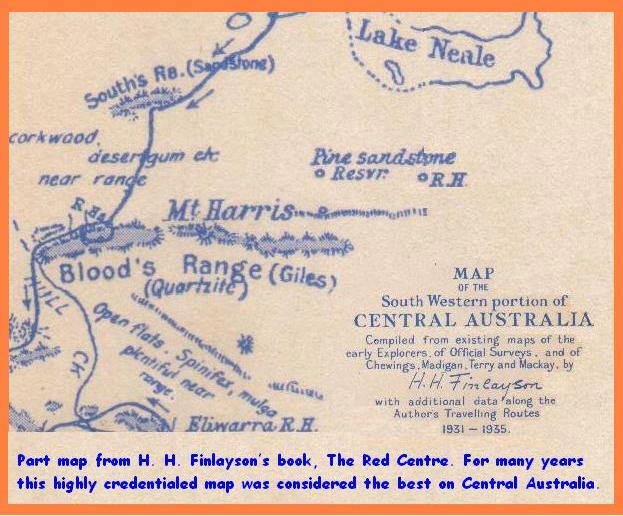 H. H. Finlayson, The Red Centre.